The revival of the state-acquired Celestial Residencies, better known as Celestial Towers, at Kollupitiya has taken a new twist with an entirely new company taking over with an investment of Rs.4.2 billion far less than the earlier valuation of Rs.9.2 bilion, official sources said. The site is one of the iconic properties of collapsed Ceylinco group of companies and was acquired under the Revival of Underperforming Enterprises and Underutilized Assets Act as an underperforming asset. Earlier a consortium led by the Sri Lanka Insurance Corporation (SLIC) was formed to take over the partially-completed Celestial Residencies, with an initial investment of Rs. 6.8 billion. 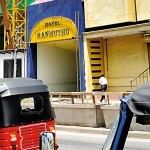 In a new and still unexplained development, Sino Lanka Hotels & Spa Pvt Ltd has taken over the project and plan to install the Hyatt Regency hotel there, a company official at the site said. The Finance Ministry in its 2011 annual report said the partly constructed building was being transformed into multifaceted hotel complex, through a consortium of private and public entities, while compensation is paid to 3rd party stake holders. There was no hint of a transfer of ownership. Construction work of the Celestial tower building which was halted in 2009 due to funding shortage has resumed, the company official said.� He told the Business Times that Hyatt Regency Hotels Ltd will manage the 450-room super luxury hotel at Celestial tower after the completion of the building by contractors, Maga Engineering (Pvt) Ltd. The building has been constructed up to level 15. The partly constructed building and the 242 perch land has been deteriorating daily, and hence there was an urgent need to recommence the project to avoid further financial losses and physical damage, he added. UNP MP Ravi Karunanayake recently revealed in parliament that Sino Lanka Hotels and Spa Pvt was formed in November 2011 with an initial capital of just Rs.40 by four individuals. He questioned as to how this company had purchased the Rs.9.2 billion rupee Celestial Residencies at a price of Rs. 4.2 billion. When contacted Mr. Karunanayake told the Business Times that he suspects some underhand dealing in awarding the project to an unknown company. He added that the Ceylinco Homes International Lotus Tower Company owes Celestial Residencies close to Rs. 3 billion in a secured loan from Seylan Bank and a similar amount in advances to apartment buyers. He revealed that a sum amounting to Rs. 700 million which was granted as a loan for the construction of Celestial Tower by Ceylinco Shriram company is due to be realized from this project to make repayment for disgruntled depositors. He said the new deal of Rs.4.2 billion is not sufficient to settle all these debts. Competent Authority of Celestial Tower Kalinga Indratissa was not available for comment.